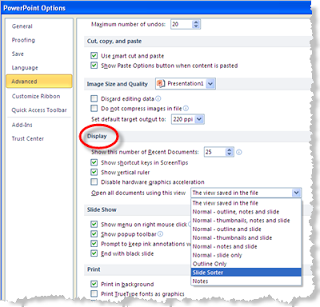 Default View for PowerPoint 2010 – By default, PowerPoint opens up in normal view, which is the view showing the large slide to begin your work. But, did you know you can tailor PowerPoint to open in another view instead? How would you like all future presentations to open in slide sorter view or perhaps in outline view? It is a simple matter of a few quick clicks to change the settings for this feature. When you first open PowerPoint 2010, the default setting for viewing your slides is set to normal view. This setting shows the full slide and the thumbnail view of several other slides in the presentation, in the left task pane. Notes are also shown below the slide, if any notes have been attached to this slide. You do have the option to make a change to this opening view of your presentation. You can change the default setting to open in slide sorter view, slide show view, notes pages to name just a few. Once you change the default view, each time you open a PowerPoint 2010 presentation, it will open in the newly chosen view. Click the PowerPoint Options button. 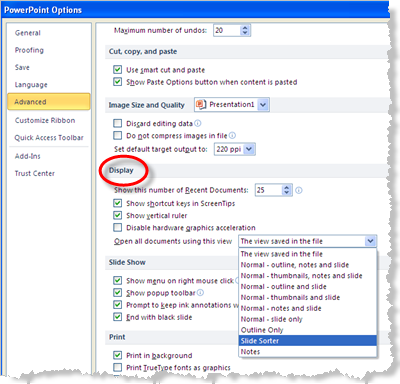 Select Advanced in the left pane of the PowerPoint Options dialog box. Under the Display section, note the option for Open all documents using this view. Click the drop down arrow beside the current selection — (the original PowerPoint setting is “The view saved in the file”). Click on the setting of your choice. This new setting will now be applied to all presentations opened in PowerPoint 2010 (on this computer).